Mercy. It’s a core value of the Catherine McAuley Center (CMC) inherited from our foundresses, the Sisters of Mercy. Their compassionate service and belief in the dignity of every person is at the heart of our educational and supportive services for immigrants, refugees, and women. It is also a reason why the Catherine McAuley Center adds our voices to the call for housing policy that mends the gap for women experiencing homelessness. 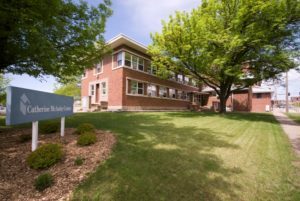 Serving women has always been central to the Catherine McAuley Center mission. 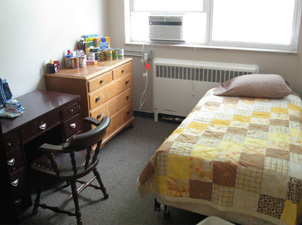 Today, CMC’s Transitional Housing Program provides shelter, food, and hygiene necessities so that women experiencing homelessness have a stable environment while they also receive individualized case management and group learning opportunities to help them overcome the barriers that led to their homelessness in the first place. These barriers to stability—mental illness, substance abuse, lack of access to healthcare, or other past trauma—differ from those experienced by homeless men and therefore require a different solution, an idea not accounted for by the U.S. Department of Housing and Urban Development’s definition of homelessness. Currently, HUD defines homelessness as “a person sleeping in an emergency shelter or place not meant for human habitation,” as opposed to the broader “near-homeless” status which includes people “who reported currently living in their own place or someone else’s place,” (Continuum of Care Planning and Policy Council, pg. 2) but are in danger of losing their current shelter at any time. Women disproportionately fall into the “near homeless” group, choosing to stay indoors with whichever friend or family member has space available, even when it means experiencing emotional, physical, or sexual abuse, a circumstance that is still less frightening than the risk of experiencing assault or trafficking while living on the streets. Disturbingly, only those who are classified as literally homeless are eligible to receive homeless services under current HUD policy. The many unseen near-homeless women are turned away from desperately needed community homeless programs. In recent months, a CMC resident named Amy* experienced this hardship firsthand. 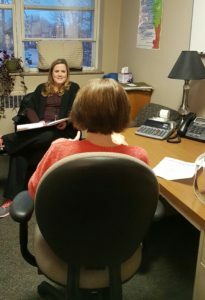 Wanting to escape the unsafe homes of acquaintances where she had been staying, and lacking resources to manage her diabetes, Amy sought support from the centralized intake center for homeless services but was turned away because of her “near-homeless” classification. One disheartening option would have been to first move to the streets in the middle of a cold Iowa winter, but with her diabetes already taking a toll on her eyesight and mobility, she likely would not have survived a short period of time. Fortunately, the Catherine McAuley Center provides mission-driven services with the support of private funding, and Amy was not only able to get connected with resources to help her manage her health, but also build healthy relationships with other women in the program, learn new skills, and was encouraged by a local employer to apply for a job after a mock-interview session provided by the Transitional Housing Program. We can improve housing policy so that more near-homeless women receive the resources they need immediately. Advocate for the funding of programs like the Community Development Block Grant (which supports CMC housing facilities) and the Low Income Household Energy Assistance Program, but just as importantly, keep talking. Amy’s story has a positive outcome because she was seen, but many more women in similar circumstances are never noticed. Ask your legislators– national and local– to view every piece of housing policy through a gender lens and make sure women don’t fall through the cracks. Keep talking about women in homelessness, even when it appears that most people living on street corners are men. Keep talking, and help mend the gap for women experiencing homelessness. Linn County Continuum of Care Planning and Policy Council, “Breaking the cycle of homelessness in Linn County”. Individual and Family Needs Survey Results. July 27, 2016. This entry was posted in Housing on July 27, 2017 by networklobby.